Eden Hazard’s first-half penalty was the difference at Wembley Stadium, as Chelsea sealed a narrow victory over Manchester United to lift the FA Cup for an eighth time. It’s been a disappointing campaign domestically and in Europe for the Blues – so much so that this could turn out to be Antonio Conte’s last game in charge of the club – but this victory at least added some silverware to their amply stocked trophy cabinet. For United, meanwhile, it’s a bitter defeat for Jose Mourinho against his former employers, and one that sums up an underwhelming season. 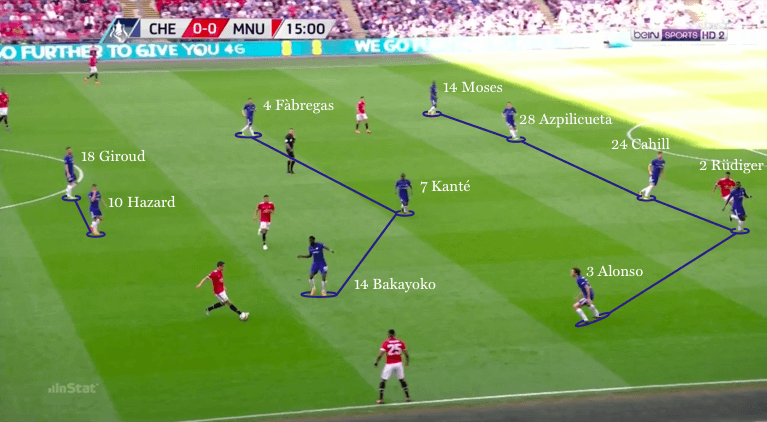 Here, our professional coaches analyse the tactics and key moments from Chelsea’s triumph – and assess what went wrong for Mourinho and United. Chelsea set up in a 3-5-2 formation, but spent the majority of the match without the ball in a deep 5-3-2 block. 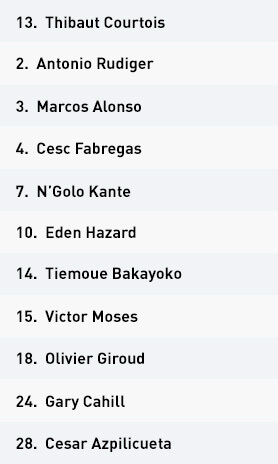 Eden Hazard operated as a second central forward alongside Olivier Giroud. From the first whistle, Manchester United midfielder Ander Herrera imposed himself on Hazard, shadowing the Belgium forward across the pitch. 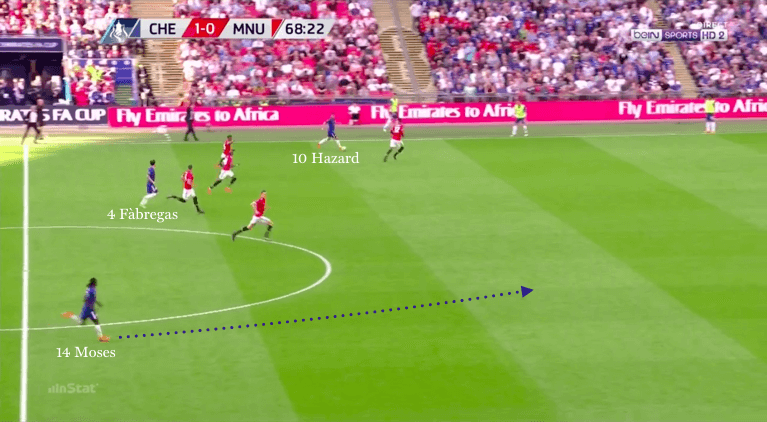 Hazard, though, was unfazed and intelligently lured Herrera away from the central spaces, often towards the touchline on both sides. This temporarily opened the central lane, granting Cesc Fabregas and Tiemoue Bakayoko access to play the ball into the feet of Giroud. 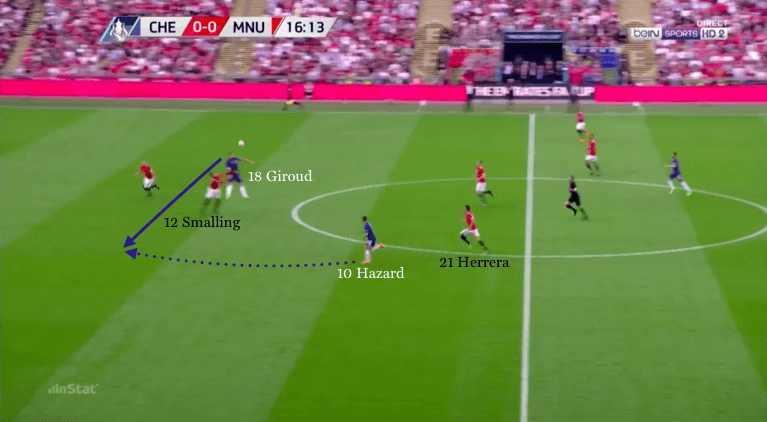 Despite this initial passage into the France striker, central defenders Phil Jones and Chris Smalling defended well, limiting his attacking presence. Chelsea remained in a mid/low defensive block throughout the first half. They were patient in defence and rarely committed into aggressive tackles, as they blocked off United’s central access. They also encouraged their opponents to play in the wide areas; with Marcus Rashford and Alexis Sanchez leading the attacking line, their central defence could comfortably cope with crosses into the penalty area. Possession was limited for the Blues during the first half. They looked to build using direct attacking transitions, targeting Giroud with early aerial passes forward. 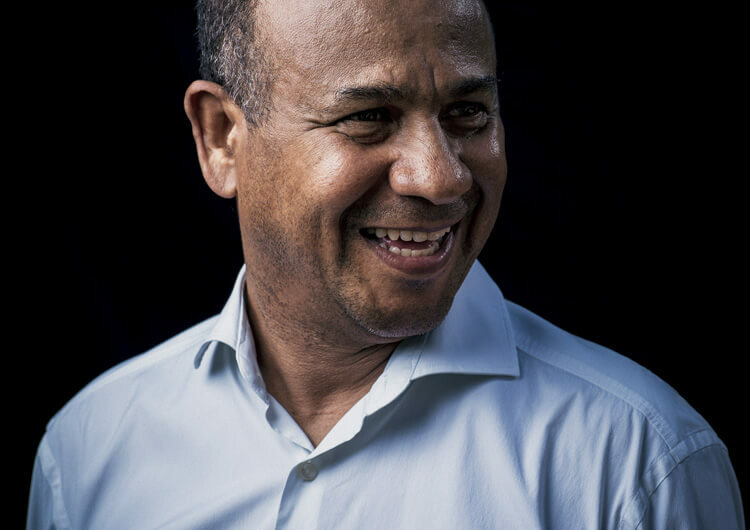 The former Arsenal forward often moved to the left side, aiming to attack the space in between Smalling at centre-back and Antonio Valencia at right-back. He was supported by Hazard, who looked to drive at the United defence after latching on to loose balls and knockdowns from his strike partner. 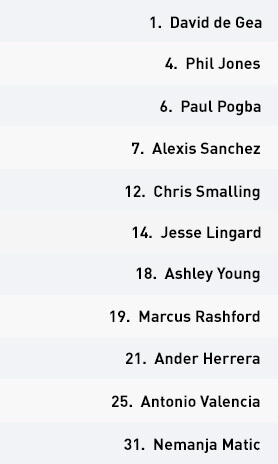 United’s back line was sloppy in possession, often gifting the ball back to Chelsea’s midfield. Earlier warning signs were there, as Jones’ pass was intercepted by Bakayoko, who slipped in Hazard. The Belgian drove on goal, forcing a low save from David de Gea. Hazard’s next opportunity, around 10 minutes later, resulted in Chelsea taking the lead. 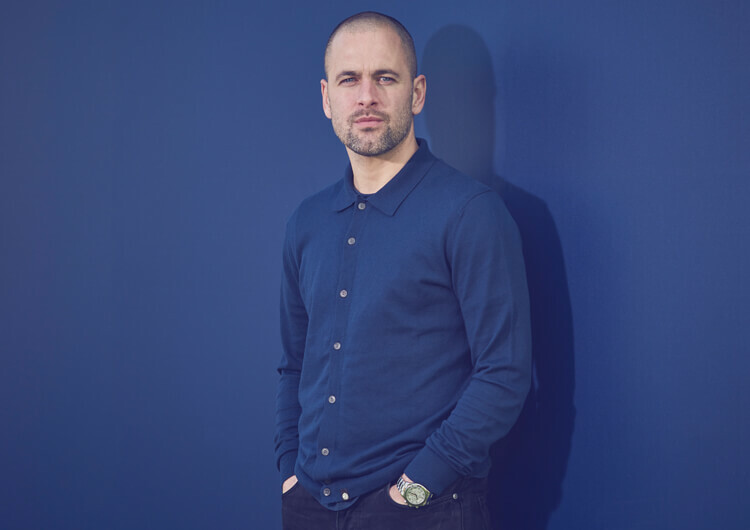 Fabregas played another through ball for Hazard to run on to, as Jones temporarily lost the flight of the ball and the run of the Blues’ number 10. His last-ditch tackle brought down Hazard, who stepped up to calmly give Chelsea an early lead from the penalty spot. As Chelsea remained in a low block after scoring, United were hugely frustrated. Thibaut Courtois only had to deal with long-range efforts. Chelsea continued in a congested low block in the second half, with both wing-backs, Victor Moses and Marcos Alonso, defending deeper throughout. Despite the Blues having more spaces to counter, they couldn’t take advantage of United’s more offensive approach. Hazard created chances for supporting runners from deep, but Chelsea’s midfield couldn’t add to their first-half opener. N’Golo Kante was a superb defensive patron in midfield. United occasionally threatened on the counter, as Chelsea threw numbers forward during attacking transitions of their own. 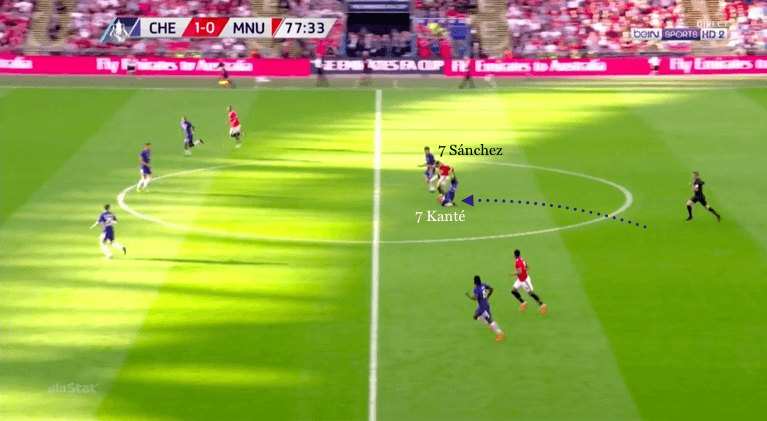 With a brief period of end-to-end action, Kante repeatedly regained possession from United’s advancements. He was also excellent in possession, often releasing Hazard down the left side in attack. Chelsea’s defence held out late on, claiming a second domestic trophy for manager Antonio Conte in his two seasons in charge. Chelsea utilised a 5-3-2 defensive structure throughout. They formed a compact low block, denying Manchester United’s attackers time and space in the final third. From the start, Eden Hazard was aggressively man-marked by Ander Herrera. 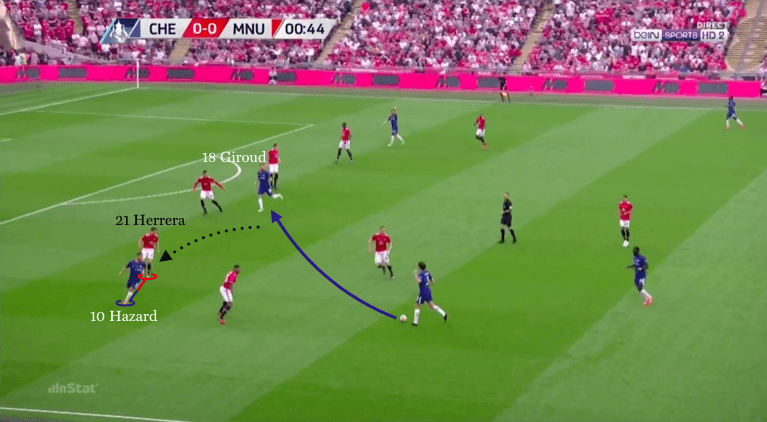 By dragging Herrera across the pitch, Chelsea created gaps through which they could play to their central attacking players. Chelsea were extremely direct after regaining possession. They tried to hit Olivier Giroud early, as Hazard broke free from the defensive shackles of Herrera. As United threw players forward in the second half, Chelsea had space to exploit with direct attacking transitions. Despite Hazard creating chances for supporting runners, however, Chelsea couldn’t add a second goal. 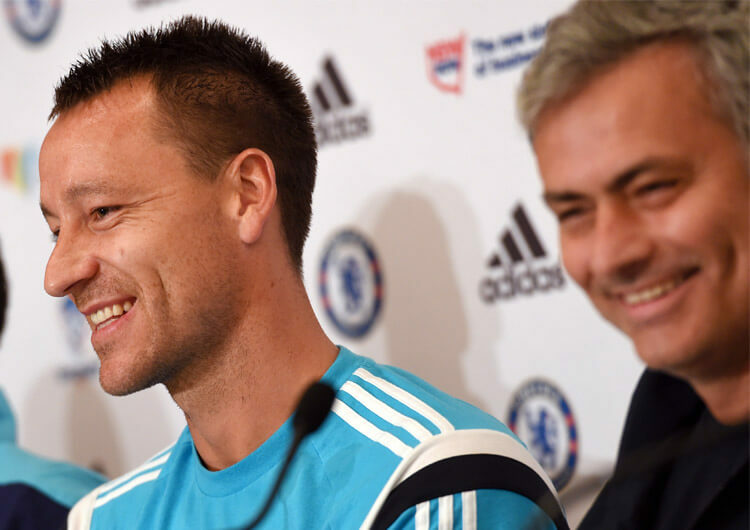 On the rare occasion Chelsea could build possession, they expanded to a large structure. When the ball was lost, N’Golo Kante was superb in preventing any potential United counter-attacks. Defensively, Manchester United set up in a 4-4-2 with a central midfield diamond. Throughout their build-up play, both their midfield and attack were largely disconnected from each other. Herrera’s prescribed defensive duties meant United struggled to connect midfield with attack when in possession. Due to a lack of attacking involvement, Marcus Rashford also dropped very short. 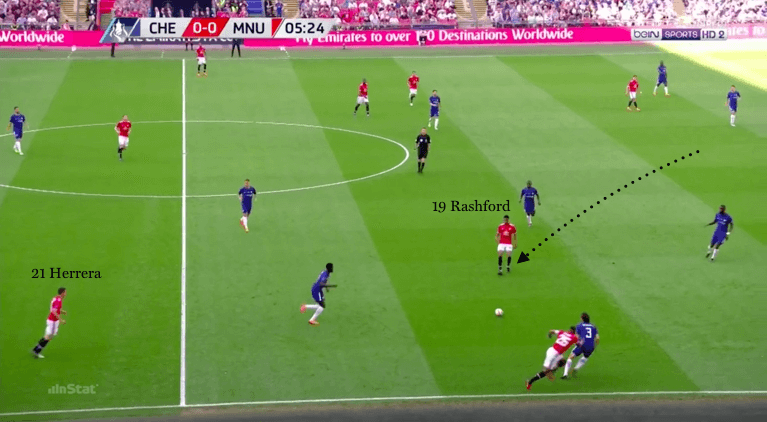 Rashford continued to move away from the central striker position. As a result, Chelsea’s central defence had minimal attacking threats to deal with. Jesse Lingard and Paul Pogba provided only sporadic support. Full-backs Ashley Young and Antonio Valencia provided much more height and attacking width throughout the second half. This stretched Chelsea’s back line and allowed midfielders to drive forward from deep. Rashford stopped dropping short, and provided more penetrative runs in behind Chelsea’s back line. This forced Chelsea’s defence to drop deeper, creating space for the midfield to continue moving forward in possession. 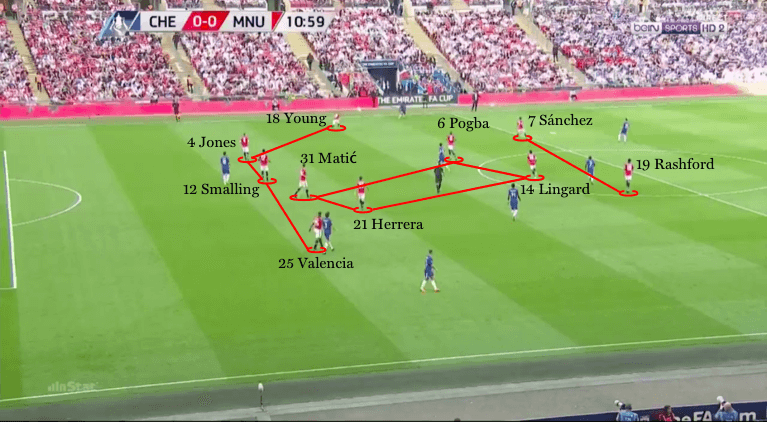 Manchester United utilised a 4-4-2 structure, with a diamond midfield four. Nemanja Matic was assisted defensively by Ander Herrera, who played deeper than usual. The Spaniard was initially tasked with aggressively man-marking Eden Hazard, as the Belgian looked to drift across to United’s right side. Alexis Sanchez and Marcus Rashford were their main central threat, with Paul Pogba and Jesse Lingard rotating in between Chelsea’s lines. It was quickly noticeable that Herrera’s defensive position reduced the attacking threat of United’s build-up play. With Herrera and Matic deep – and often behind the ball – United lacked numbers in and around their opponents’ compact block. A frustrated Rashford began to make runs around the side of Chelsea’s middle block, looking to hit the channels from midfield. He struggled to impose himself in the game, and was often forced into corners and dead ends as Chelsea’s back line swamped him. Rashford soon turned to dropping short in possession, demanding the ball to feet. 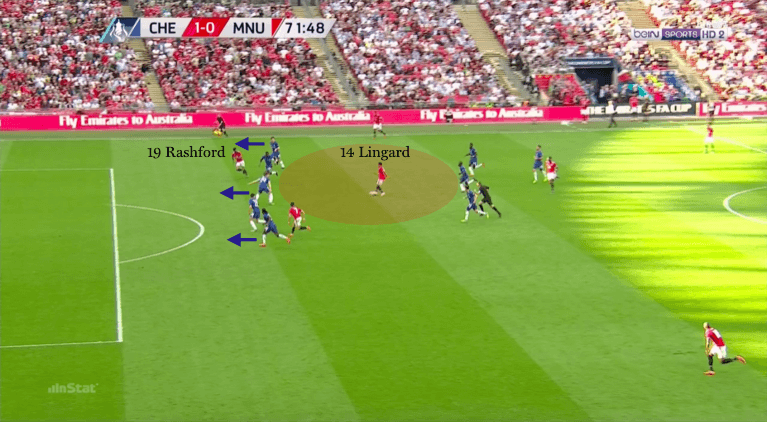 From here, United now had no centre forward to aim for, as Lingard and Pogba alternatively moved across the midfield lines, never settling for a solid attacking position. As a result, Chelsea’s central defenders were largely untested. As soon as the second half got under way, it was clear that United would have to be more assertive in possession. Rashford began to withhold his runs for the ball, and instead pinned Chelsea’s back line. 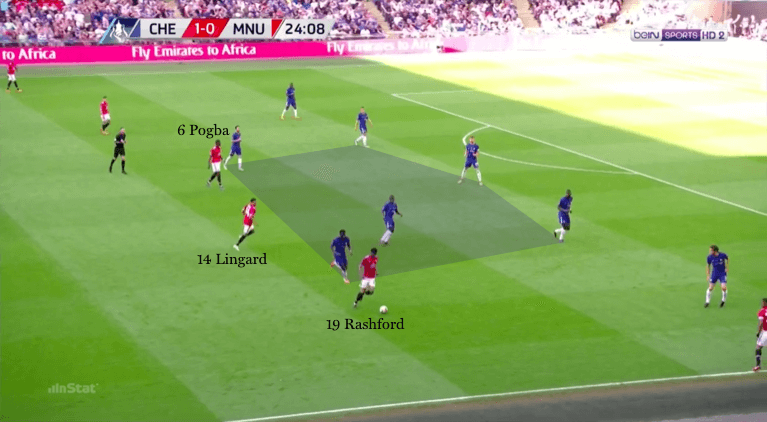 This created more space for Pogba and Lingard to drive forward in possession and take shots from range, or switch the play out to either full-back. Antonio Valencia and Ashely Young were much more proactive in the second half. They horizontally pulled Chelsea’s back line, stretching them across the width of the pitch. With Rashford more central, Lingard and Pogba could slip delicate through balls for the striker to run on to. Thibaut Courtois in the Chelsea goal had to be alert to repel a number of good United attempts. The best chance of the half fell to Pogba. After a routine inswinging corner travelled towards the penalty spot, Pogba charged inside, free of his man. The France midfielder couldn’t convert his free header in the centre of the penalty area, though, sending his effort wide. Despite late substitutions from Jose Mourinho, the twin introductions of Romelu Lukaku and Anthony Martial failed to break Chelsea’s defensive wall. As five minutes of injury time drained, the Blues held on for an eighth FA Cup final victory. The key battle involved the defensive duties of Manchester United midfielder Ander Herrera. The Spanish international was charged with nullifying the threat of playmaker Eden Hazard – but despite early attempts to shadow and screen the Belgian, Hazard often broke loose and dragged Herrera across the pitch in the process. Not only did Jose Mourinho sacrifice a player defensively, but Herrera was also somewhat out of action when in possession. Along with Nemanja Matic, United had too many players behind the ball. This made penetration virtually impossible, as Chelsea often defended with all level players deep inside their own half. United’s midfield, including Herrera, were much more proactive in possession in the second half. A goal down, their hand was forced, and the entire team became sharper in possession, finding good space in Chelsea’s half. Marcus Rashford kept his central position, while Ashley Young and Antonio Valencia provided good attacking width. Promising chances aside, however, they couldn’t beat Thibaut Courtois, leaving the United faithful to see the season end without a trophy.